This article explains how to use CSS for styling HTML pages. 'Cascading Style Sheets' (CSS) allow you to define styles, layouts and spacing separate from the content which should be styled. The CSS information is typically contained in an external file. Other code, e.g., an HTML page, can reference to the CSS file for its layout information. For example you define in an external file the fonts and colors used for certain elements. CSS is defined as a standard. Currently the versions CSS 2.1 and CSS 3 are most widely used. A selector can be one of a predefined identifier(, e.g., H1), a class name (e.g. .myclass) or an identifier (e.g. #myuniqueid). In CSS an identifier is supposed to be unique across all of the elements in a page (or window in our case) while a class can be assigned to several elements. For example the following CSS file defines the size and color of the 'h1' tag. CSS pseudo classes are used to qualify attributes of selectors. For example you can select an visited link in HTML and style is differently. In the following you create a local html page and style it with CSS. Create a new directory and create the following file called 'styles.css'. In the same directory define the following HTML file. This file defines that it uses the 'styles.css' style sheet file from the same same directory. HTML allows to define sections via 'div' containers. These 'div' containers can be used to style parts of the HTML document differently. For this purpose you can identify the div containers via id or class attributes. While id and class generate the same output, an id must be unique in the HTML document while the class attribute can be defined for several HTML elements in a page. CSS allows to style these elements via special selectors. Create the following HTML file to use the style sheet. You can also select by position in the HTML document. For example 'td a' only selects links which are within a table row. You can also use other attributes for example the following will define certain styling for links which have been visited or over which the mouse hovers. They will identify if you have a link already visited or if the mouse hovers over a link and will change the display of the link accordingly. A CSS file can import other CSS files via the '@import' statement. It must be the first rule in the style sheet using the '@import' statement. 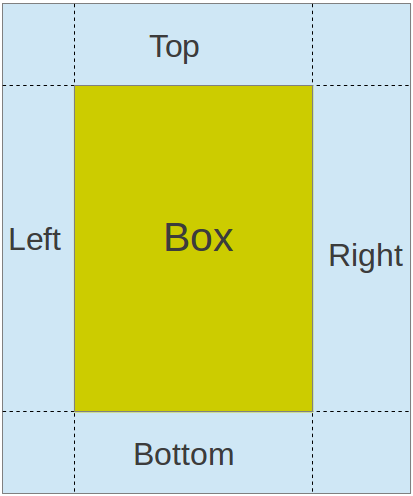 A block element can be thought of as a box which contains something. This box has a border to other elements and you can influence the distance to other elements via the 'margin' and 'padding' settings. Margin defines the outer distance of other elements. You can set values for top, right, bottom and left. You can define the margins for a box individually or combine them into one statement. Padding defines the inner distance of elements to the end of the box. The total size of the HTML box is defined by the initial size of the box, plus the margins and the padding and a border, if defined. CSS allows to setup element with fixed, relate and absolute positions. Relative is the standard and will change the distribution of the different text containers based on the available space. If you want to have a element always on a certain position you can use the fixed position and will not move even if you scroll down the HTML page. For more res see CSS positioning. You can use HTML div container and CSS to layout your webpage. Your example the following webpage uses div container. This result in the following layout. Via CSS you can use media queries to define CSS settings based on certain criteria. A common use case is to have different CSS based styling for devices with only limited pixels and other designs for larger screens. For example the following CSS defines a fixed position for a search box. If the screen has a maximum width of 750 or less different styling is used. The most consist way to define size is the unit 'em' which is a relative unit to the font-size. 1em is as large as the font-size. You can use 1em for defining the space between words (word-spacing), or letters (letter-spacing) or to define the line height (line-height) of an HTML element. text-indent allows you to define the intent of the first line of a paragraph. text-indent: -1em put the first line a bit before the rest of the text. Via text-align you can define how your content (not only text) should be aligned. text-transform allows to transform the text to upper, lower case or to capitalize the first letter. The versioning of css files is not mandatory, but it could be very useful to force the browser to load a changed css file instead of using the CSS caching. To achieve this just add '?version=1.1' at the end of the css file name when referencing to the file. The wording after the '?' has no relevance and can be chosen freely. With this solution your css changes are immediately visible and you do not need to refresh your browser with CTRL F5 until you see them. Additionally the name of the css file keeps the same which saves you a global search and replace. 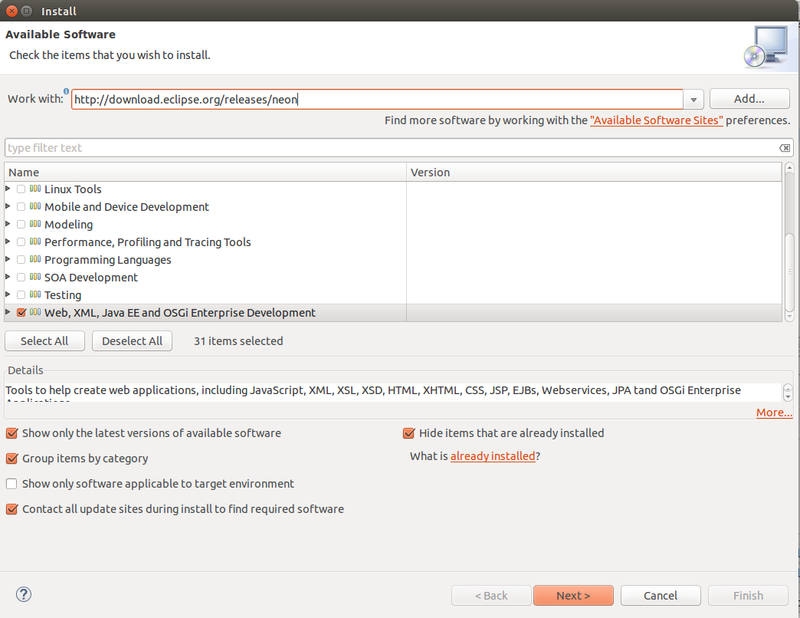 Eclipse has an integrated CSS editor which by default supports CSS2. In order to see the new CSS3 properties you must activate this feature. You can activate it per file, Dynamic Web Project or Static Web Project, but not for other types of Projects. It is also not available as a workspace-wide preference. 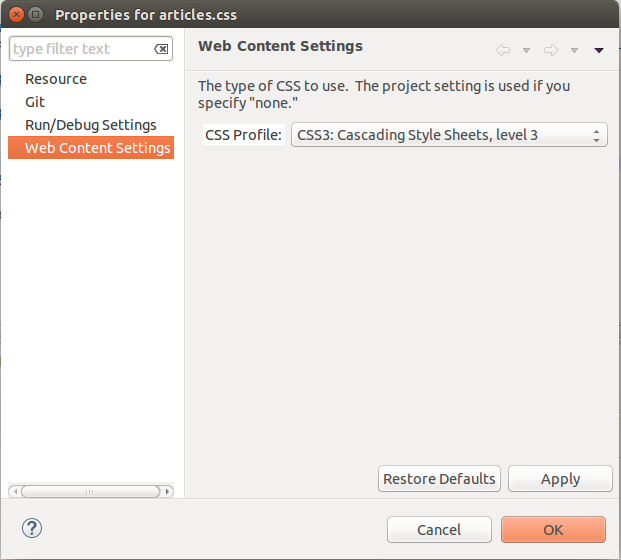 Set the CSS Profile value to "CSS3: Cascading Style Sheets, level 3"
This guide applies for Eclipse releases up to Mars. With Neon M6 the default css profile will be set to CSS3.